A local cowboy named Ebony Shaw was a popular figure thereabouts and allowed his name to be submitted. 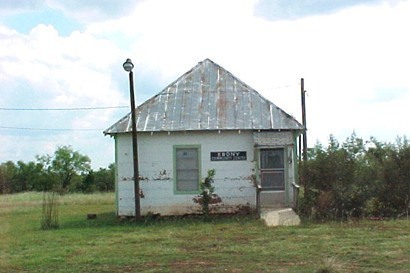 The Ebony post office opened on January 5, 1891. Now that the town had a place to pick up their mail and hang out, the population grew to 35 by 1910. 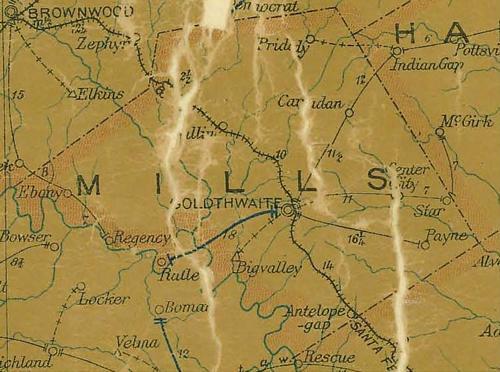 By 1930, Ebony was getting downright crowded with a population that soared to 113 people. But, if people were standing in line at the post office, it thinned out pretty fast. The Great Depression was in full swing and soon people were leaving to look for work. By 1940 there were only fifty Ebonites and in 1945 the post office closed. The town was nearly deserted by the 50s and today all that is left is the building above and the local cemetery. According to oral tradition, this cemetery originated when two sheep herders camping in the area died and were buried here. The oldest marked grave, that of area resident William R. Yankee, dates to 1882. Frank and Mary Crowder bought this land in 1889 and Mary later donated the burial site for a community cemetery for Buffalo/Ebony residents. Area pioneers and veterans are among those buried in the cemetery. 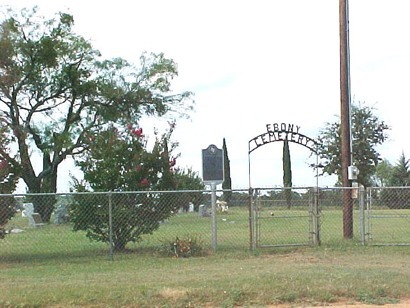 During the 1940s, the graves of three Reynolds family members were moved here after the land containing their original grave sites became part of Camp Bowie.